Now that you've added your details, you want them to look the part. A few simple tricks and they'll look war torn and blend in perfectly. A few days ago, we covered adding details to your models. Now, let's go over how to keep them from looking like they just came off the showroom floor. Nothing survives the heat of battle unscathed and it's worth knowing how to make your icons and details blend in with the rest of your force. There are lots of ways the "weather" things. We're specifically going for a couple quick and easy ways to make you iconography look battle damaged. Most of the regular weathering techniques work just fine when it comes to applying them to your iconography, simply do those techniques like you would normally on armour. For example, oil stains and rust stains. You can paint that stuff right over you iconogrpahy as if it wasn't even there. But let's get into a few things you can do for just your icons. 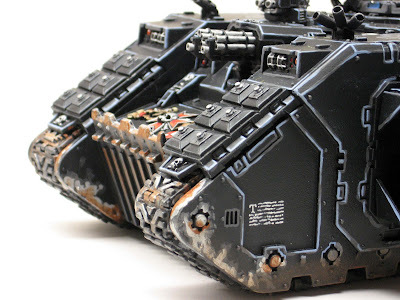 With your decal or freehand icon in place, it's really nothing more than adding a bit of your underlying armour color in a few areas to simulate chipping, peeling and scratches. If you've achieved your underlying armour color through a series of washes and mixing colors, it might be a bit more difficult to match, but not impossible. Like everything else, there are a few ways to do this too. You can use an old paintbrush and stipple the damage on... almost like a heavy drybrushing approach. Or you can use a regular fine point paintbrush to add "scratches and chips" across your iconography. Again, using your base color, you add a series of thin lines to simulate scratches across the surface of the armour and or dots to simulate the chipping. 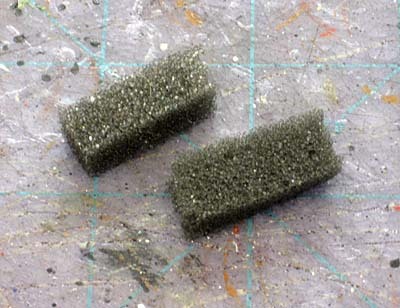 If you've used decals on your models, there is this method that involves the use of fine grit sandpaper to "weather" them. This video from misterjustin shows how to do it. Now he covers vehicles in this video, but I'm guessing the same approach would most likely work for things like shoulderpads too. 3. Using a sponge and paint There is the sponge method where you get yourself a small piece of sponge (the stuff from blister packs works great) and you dab it in paint, get some excess off and then dab it on your model. So let's look a our two examples then shall we... I used a few different approaches on each one to show you a variety of results (so you can compare them). 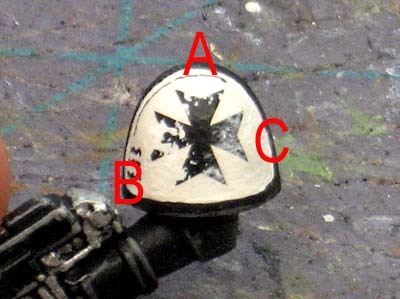 Example 1: Black Templar shoulderpad A: Fine detail paintbrush with a minimal application of paint. I think this approach works best. You get the "effect" of damage without obscuring the underlying image. It allows you to be very selective in applying your damage. B: Sponge with paint. I think the sponge effect is too much here and better suited for larger icons on vehicles and such. It covers too much of the detail and I have trouble figuring out what the original image is. The Painting Corps goes into the sponge process in this article here. C: Old paintbrush with stippling effect. I think this one might be better left for your larger images and vehicles too. It doesn't have the look we're going for here and instead looks like you just dropped the brush or made a mistake in your painting. This one can be tough to do since there is that chance that your stippling will come across as brush strokes and not damage. You need to use a variety of pressure and brush positions otherwise the human eye will pick out the patterns in the damage and the effect will be instantly killed. Here's where the stippling effect really comes into it's own I think. Damage on vehicles. Another problem you might have is needing to load up the brush with paint to get this approach to work and that can leave blobs of paint on the surface of the model. 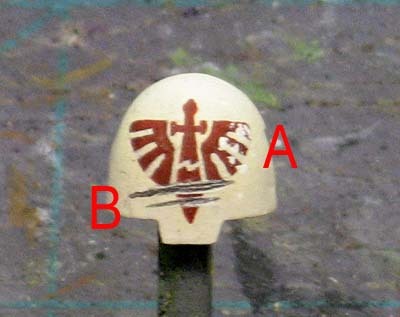 Example 2: Deathwing shoulderpad A: Sponge with paint. Again, I think the sponge effect is too much here and better suited for larger icons on vehicles and such. It covers too much of the detail and I have trouble figuring out what the original image is. This is really pronounced on an image such as this one where it has much finer detail in the original image. B: While this isn't part of the techniques listed above, it goes to show that applying "regular" battle damage over icons like they aren't even there works just as well. Things like deep gouges and chips in the surface of armour can be replicated right over iconography. In this case it was two simple white lines with thinner silver lines painted over them. The silver lines are offset allowing some of the original white line to show on the underside to represent the reflection of light on the edge of the gouge. 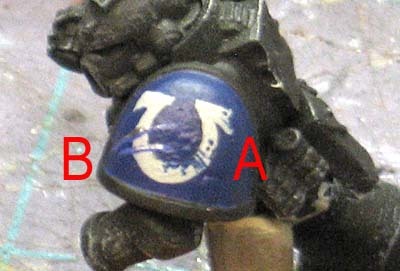 Example 3: Ultramarines shoulderpad And one more example on a dark background since both previous ones were light colored. Real quick, I painted an Ultramarine symbol onto a shoulderpad. Again, breaking it down into two offset circles with two small triangle shapes at the top corners makes it much easier to do. 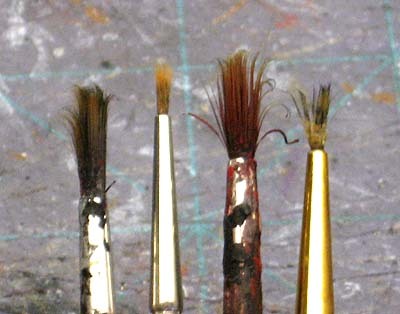 A: Fine detail paintbrush with a minimal application of paint. Like I said, I think this method works best (at least for the results I like). B: Application of deeper armour damage over iconography as if it weren't present. So how much damage is enough damage? This is a good question and is worth talking about when it comes to damage. Each of us has our own opinion on what is "enough." It comes down to what looks good to you. I would say to keep a couple things in mind when adding damage to your models. 1. Less is better. You're going for the suggestion of damage, you don't have to show every last bit of it to make it believable. 2. Vary your techniques and their locations. 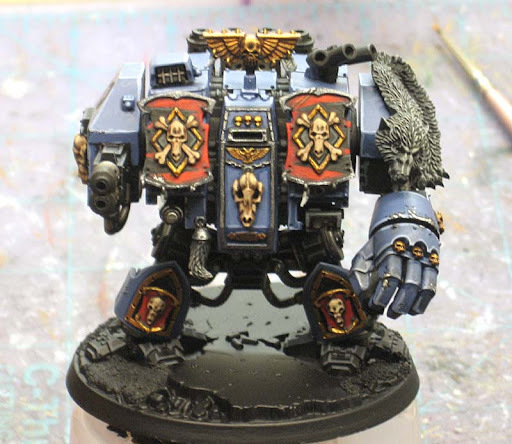 And to tie it all together, let's look at a Space Wolf Dreadnought I did a while ago for a friend of mine. It has a few different techniques used on it that when combined, bring the model to life and give him a bit of character. On his powerfist I used the paintbrush and stippling effect for some larger damage. I also used a detail paintbrush with paint to get damage in key areas to make things look "right." On his multimelta, I made the gun barrels look soot stained and used. On his left torso shield, I added some superficial scratches. These were done by applying a thin line of black and then offsetting a thin line of the base color highlight on top of that. This gives the illusion of s light scratch and not being deep enough to see the bare metal underneath. Awesome stuff! This is definitely "Pro Class" stuff here. Thanks! Very good stuff! I'll try it on my guard next month! If you tell everyone for free, all the armies will be painted soon and we will have to find something else to complain about. I thought you took a file to the Death Wing pad, it is very convincing. I don't know about "Pro-Painter" stuff... they're just simple little tricks you can add to your own models to make them stand out.